Synthetic non phosphopeptide derived from human FOXO1/3/4 around the phosphorylation site of threonine 24/32 (S-C-TP-W-P). 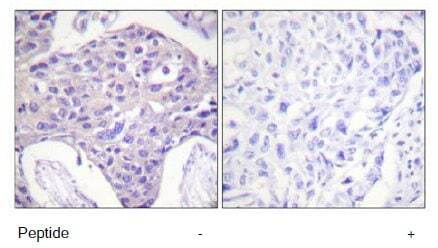 The antibody was affinity purified from rabbit antiserum by affinity chromatography using epitope specific immunogen. Our Abpromise guarantee covers the use of ab58518 in the following tested applications. FOXO1 + FOX3 + FOX4 belong to the forkhead family of transcription factors. FOXO1 (FKHR or ForkHead in Rhabdomyosarcoma) is a 70 kDa protein. Recent studies have shown that this protein can act as either a coactivator or a corepressor of nuclear receptor activity. This action is mediated through the LXXLL motif found in the C terminus of the FOXO1A protein. The specific function of the gene has not yet been determined. FOX3 probably functions as a trigger for apoptosis through expression of genes necessary for cell death. Translocation of the FOXO3 gene with the MLL gene is associated with secondary acute leukemia. FOX4 is a forkhead transcription factor involved in the regulation of the insulin signaling pathway. It binds to insulin-response elements (IREs) and can activate transcription of IGFBP1. FOXO4 down-regulates expression of HIF1A and suppresses hypoxia-induced transcriptional activation of HIF1A-modulated genes. It is also involved in negative regulation of the cell cycle. FOXO1: Cytoplasm. Nucleus. Shuttles between cytoplasm and nucleus. FOX3: Cytoplasm, cytosol. Translocates to the nucleus upon oxidative stress and in the absence of survival factors. FOX4: Cytoplasm. Nucleus. When phosphorylated, translocated from nucleus to cytoplasm. Dephosphorylation triggers nuclear translocation. This image shows human breast carcinoma tissue stained with ab58518 at 1/50 dilution. Right hand image; tissue treated with immunising non phosphopeptide. Left hand image; without immunising non phosphopeptide. ab58518 has not yet been referenced specifically in any publications. Publishing research using ab58518? Please let us know so that we can cite the reference in this datasheet. There are currently no Customer reviews or Questions for ab58518.